I want to enable SSL for all web applications. Can I use single certificate to do this or do I need one certificate for each web application in my farm? Please share any tutorial if possible? Yes it is possible to use a single certificate. This needs to be a wildcard certificate. It can be a "Domain Certificate" as well as a certificate from a cert service as Verisign. Your web applications in SharePoint could be like this. The wildcard certificate must be for *.domain.com. It is as well possible to use single certificates for every web application. I would prefer the wildcard-certificate solution. Go to your SharePoint web frontend server. That is the server hosting your web applications. Open "Internet Information Services (IIS) Manager". Click onto the servername in the left pane. Doubleclick "Server Certificates" on the middle pane. You will see your certificates imported to the web server here. 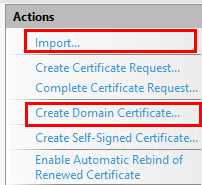 On the right pane you will see the possible actions to import a bought cert or to create a domain signed cert. Just follow the wizard. When your certificate in available in the "Server Certificates" list you can go to the next an final step. Expand "Sites" on the left pane. Click onto the web application you want to use with ssl. On the right pane you select "Bindings". Add a binding and refer to the following screenshot. Now your site is available in https/ssl. You can try to open sites on that web application with ssl now. Repeat this steps for all of your web applications. Check Central Administration - Application Management - Web Applications - Alternate Access Mappings afterwards. You can remove the "http" bindings to prevent users from using http to open SharePoint. Using a bought certificate is recommended because it is accepted by all types of client devices. Domain signed certificates must be trusted by all client devices. Not the answer you're looking for? 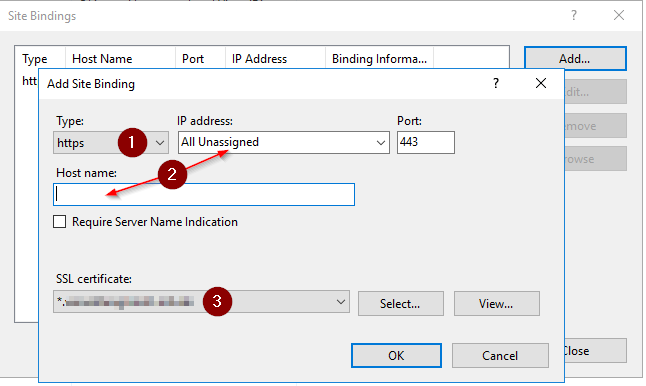 Browse other questions tagged sharepoint-server 2016 ssl or ask your own question. Do I need SSL certificate on all ShP servers or just on frontend ones?